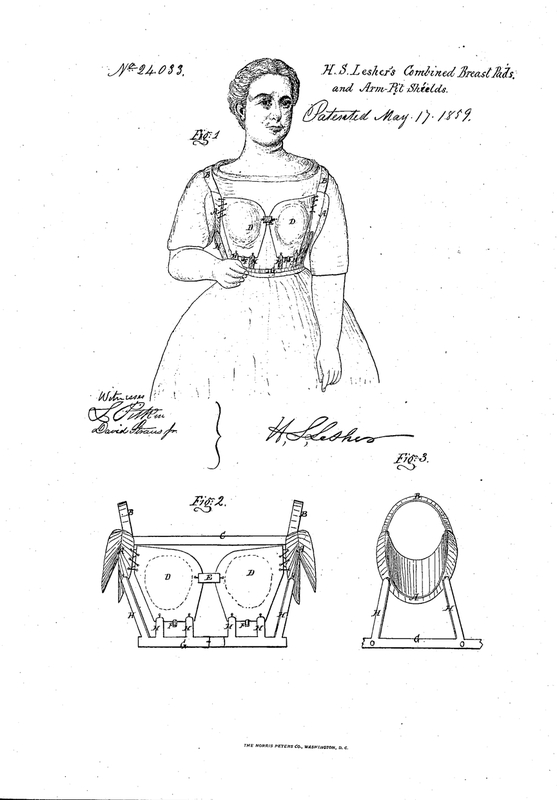 The bra as we know it today — with cups for each breast and back and/or shoulder straps — was invented in the second half of the 19th century in a number of configurations under different names. 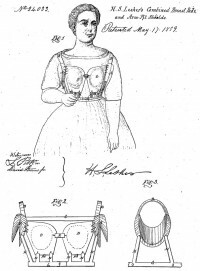 The term “brassiere” took off when it got a mention in a 1907 issue of American Vogue, and brassieres themselves were fully established in retail outlets by the end of World War I. 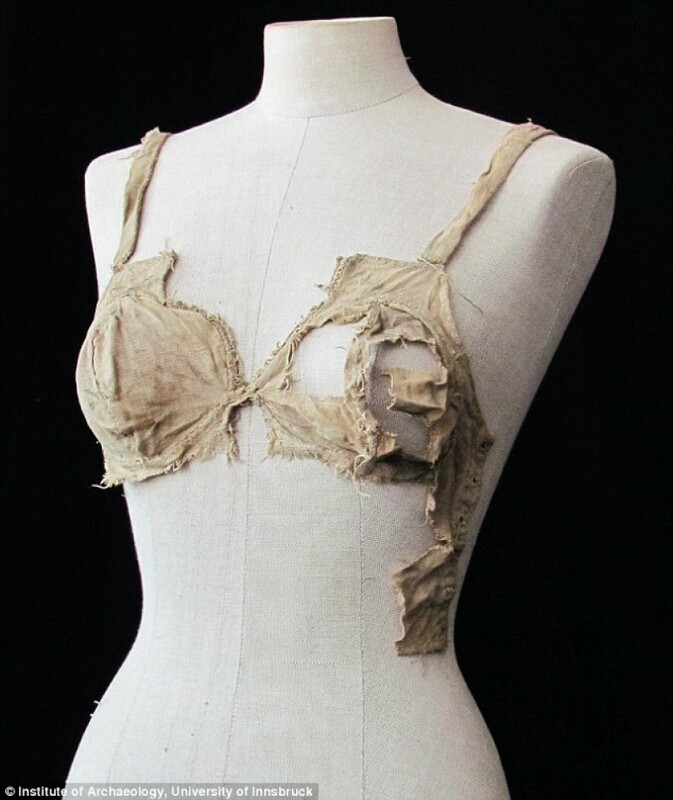 Before that, women wore corsets or chemises or, going back into antiquity, tied straps over or under their breasts, to contain them in the former case or enhance them in the latter. A treasure trove of Medieval garments discovered in Lengberg Castle, East Tyrol, Austria, has advanced the era of the bra 500 years or so. The clothes were discovered during the course of renovations which began in the summer of 2008. In 2009, researchers discovered a vault filled with dry materials behind a wall in a second floor room. The fill had been packed in layers, among them twigs and straw, 200 coins, 160 cardboard playing cards, metal fragments, bones, glass, pottery sherds, carpentry scraps, writing scraps, leather shoes and fabric, lots and lots of fabric. The final tally was more than 17 boxes filled with 4,000 sundry fragments. From that massive cache, 2,700 of them were fragments of woolen, silk and linen textiles. Archaeologists thought they must have been placed in the wall when a second story was added to the castle in 1485. Radiocarbon dating on some of the fabric fibers confirmed the age: these were extremely rare surviving textiles from the late 15th century. The surviving fabric was mainly linen, some of it used to make entirely preserved garments like shirts with pleats on the collars and sleeves and fabric buttons. The small cuff circumference suggests those shirts were for children or women. Some of the linen pieces were linings of wool garments, including the crotch of a pair of red and blue men’s pants. 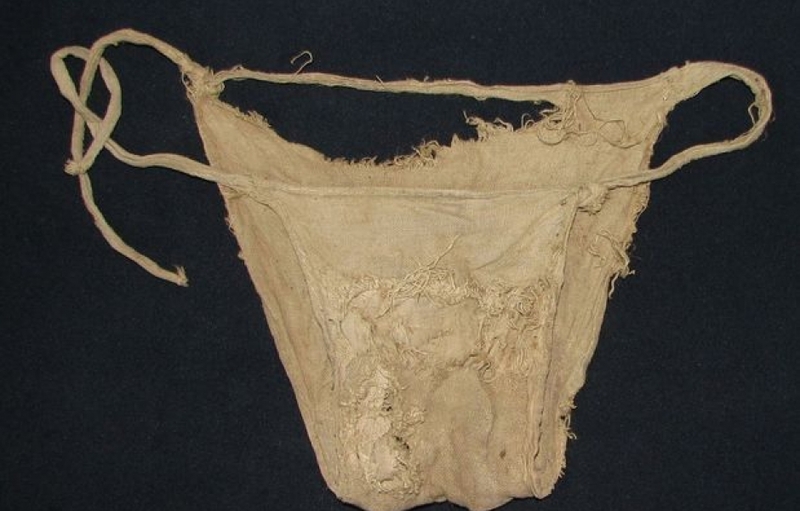 A complete pair of linen underpants that look like a string bikini were also menswear. Exceptional examples of needlework lace were found decorating some of the seams, suggesting those garments had been worn by the masters and mistresses of the house before being put to use as a wall filler. Four pieces out of the 2,700 drew the particular attention of historians because of their cut and sewn cups. Two of them are highly fragmented but appear to have been bustiers of sorts, a bra with visible shirt elements under the breast and providing some cleavage coverage above. The bottom hems are decorated with braided lace stitching which in addition to being pretty also provide additional support under the breasts. Sprang is needlework construction similar to netting that provides a natural elasticity, an ingenious construction element for a 532-year-old bra. Doctoral student Beatrix Nutz will be analyzing the textiles in more depth. In addition to microscopic analysis of the fabrics, she also plans to do DNA tests CSI-style to hopefully determine which gender might have worn the garments, and to do chemical analyses of the pigments. This entry was posted on Wednesday, July 18th, 2012 at 11:50 PM	and is filed under Medieval. You can follow any responses to this entry through the RSS 2.0 feed. You can skip to the end and leave a response. Pinging is currently not allowed. Awesome idea! I’m totally going to stuff all my old stretched out bras into the wall for extra insulation. It’ll be like those piles of rusty used razor blades you find behind the “razor deposit” in old hotel bathroom walls. Used underwear as wall filler is really good recycling technique! Fascinating that these support garments have been around for so long. I’m really digging the hand stitched sprang lace microweave! I’d take a flexible, light linen camisole over a bone corset any day. Corsets give me the fear. They can be terribly pointy, especially after hours of wear. Let’s get sprang!